Let’s start with the elephant (well, lobster) in the room: it would somehow be wrong of me to write a review of Valpy Street without at least a passing nod to its most (in)famous previous incarnation. Those hallowed halls were the location where I ate the worst meal I’ve reviewed so far and, I think, an indication of how far the spot had fallen since its earlier success – still discussed fondly by many Reading residents – as Chronicles. Indeed, the new owner is in fact the old owner; fed up of seeing the site go through one sad iteration after another he decided to come back and reinvigorate the handsome basement rooms (the story goes that the last straw was an application to turn the premises into a lapdancing club). It looks so nice now that I didn’t even suffer any flashbacks. The upstairs – a grotty sandwich bar back when this was Valentino’s – is now a little bar area looking out onto the street. But really, it’s all about the downstairs: there’s something about a cellar restaurant, especially with winter on the way, that feels somehow snug and exclusive and they’ve made a really good job of doing it up (Farrow and Ball paint: check, exposed brickwork: check, tongue and groove panels: check). The furniture is attractive, the tables are a decent size and there are some nice booths along one side which adds to that feeling of cosy seclusion. I’ve heard good things in the months since Valpy Street opened, so I was surprised to trot down the stairs on a week night to see it pretty empty, with only a few tables occupied. The menu had lots to tempt, with an interesting range of starters hovering around the seven pound mark and more conventional bistro-style main courses (lamb shank, duck breast, two types of steak) generally weighing in around fifteen pounds. Reading it, I realised that this is the kind of restaurant Reading is missing, because we don’t really have any mid-range independent bistros. You either go for much more informal, cheaper dining, you move up a price bracket to LSB or Forbury’s, or you opt for a chain. Please let this be good, I thought to myself. Would my prayers be answered? The starters gave me my first clues. 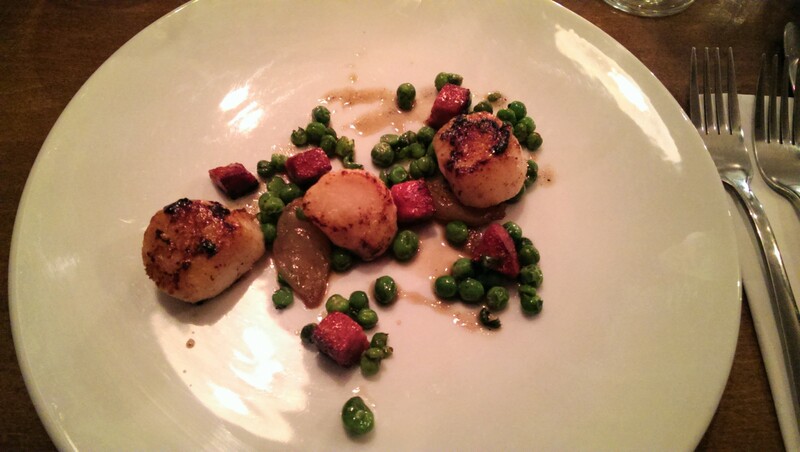 Pan fried scallops came with peas and onion, crispy chorizo and beurre noisette, a pretty classic combination. Normally they also come with soft herbs (no, I’ve no idea what that means) but I was with my coriander-phobic companion so we missed all the herbs out to ensure there was no meltdown. The scallops – three medium ones – were pretty decent, cooked in the browned butter and nicely textured so they were lightly caramelised on the outside but still yielding within. The peas and onions and chorizo reminded me a bit of petit pois a la francaise, but without the indulgent cream which always makes me feel so guilty about ordering it. They worked quite well, especially the touch of salt and warmth from the chorizo which lifted the dish pleasantly. Not the prettiest dish to look at (it all looked a bit plonked on the plate) but a good start. 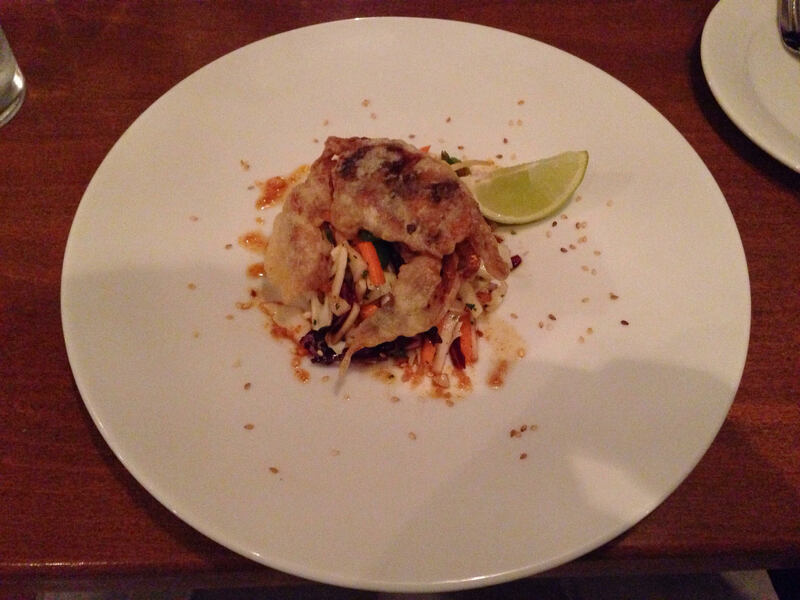 The other starter was one of the most intriguing things on offer – tempura soft shell crab with an Asian influenced salad of shredded cabbage, carrot and mooli. It was the only time that the menu wandered away from its firmly European sensibilities, but it sounded so good on paper that I had to try it. Broadly speaking, it was a success. The salad was full of crunch and zest with an awful lot going on, especially with a gradually growing heat from the deep green shreds of chilli. I liked the presentation, with the toasted sesame seeds dotted round the edge of the plate. If anything, the salad upstaged the crab sitting on top of it. I’ve always loved soft shell crab – possibly the only member of the animal kingdom that might have caused Charles Darwin the occasional moment of doubt – and this was pleasant but the batter wasn’t quite tempura, lacking the crisp lightness I was hoping for. It was also dinky almost to the point where you felt like you weren’t so much eating it as bullying it. All good, then, but possibly a touch on the nouvelle side. 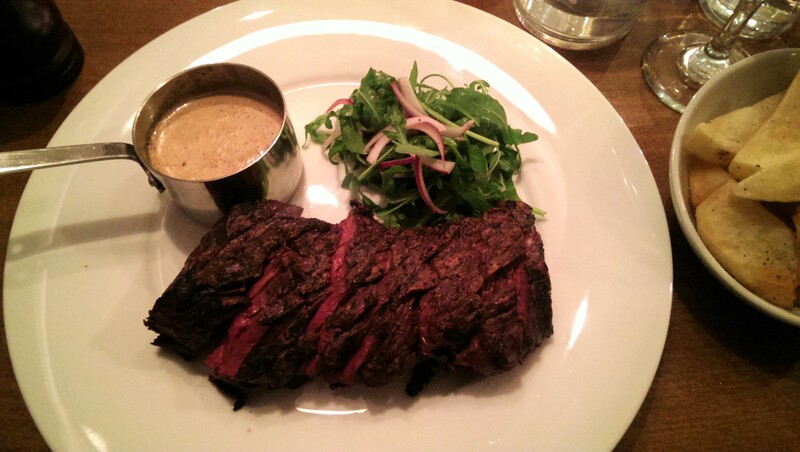 You couldn’t say that about the gigantic piece of onglet which turned up when the mains arrived. I’d ordered it rare (the waitress suggested rare or medium rare) and rare it came. My mistake, to be honest: onglet can be a tad chewy and it definitely needed a bit longer. To her credit, the waitress came back to check on the food and quickly twigged that I wasn’t happy – so she sent it back for a little more time under the grill which improved matters considerably. The salad it came with was delicious, just dressed rocket and thinly sliced red onion: not something I would normally choose but which really went perfectly with the steak. The chips were thick and wedgelike, but sadly not terribly crispy. When ordering the waitress asked what sauce I wanted (blue cheese, red wine or peppercorn) and so I also had a little copper saucepan of peppercorn sauce. This was really lovely but I didn’t find out until the bill arrived that I’d been charged nearly three quid for the privilege. Now, I don’t mind paying extra for a sauce but I definitely felt like this was a little sneaky – there was no mention of the sauce on the printed menu (there is on the website, curiously) and the waitress didn’t say that there would be a charge, so I felt a little hoodwinked. Overall it pushed the cost of the dish over the twenty pound mark, and therein lies the real problem: onglet is a cheap cut, and for that money I could have had better meat from CAU – a little less of it, maybe, but better quality and cheaper. Herb crusted hake was less successful. 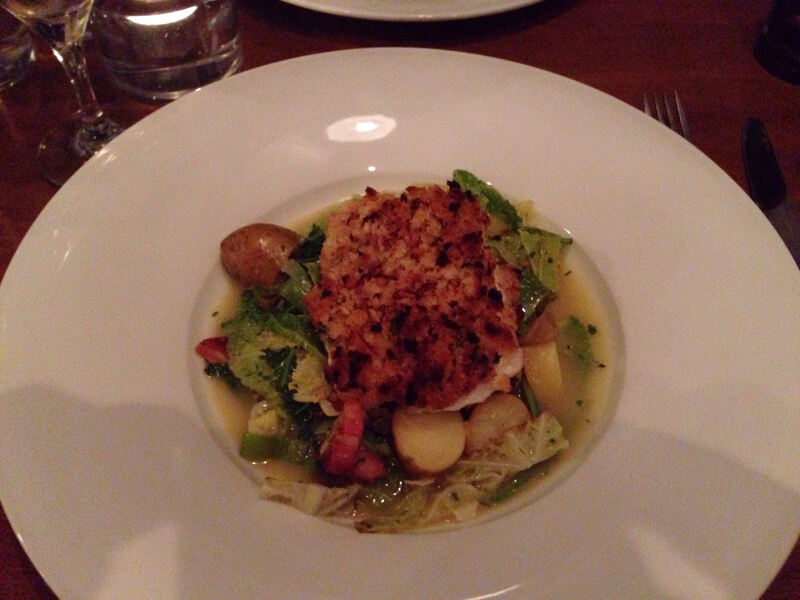 It was a pleasant – if not massive – piece of fish and the herby breadcrumbs on top of it were lovely, although I was surprised to find skin on the bottom of the fillet. But everything else didn’t quite work. It came with “bacon lardons” (are there any other kind? ), little halved new potatoes, cabbage and leek and all of them were decent if inoffensive. But the herb broth, which I was hoping would bring the whole thing together, was largely a flavourless stock. More than anything else I ate that night, or anything I’ve eaten for a while, it felt like home cooking rather than restaurant cooking. If I’d eaten it at a friend’s house I’d have said nice things, but for just shy of fifteen pounds it wasn’t something I’d rave about when eating out. I can’t quite remember why we ventured onto desserts after eating so much steak, but venture on we did. Tarte tatin is one of those French classics that’s difficult enough to make at home that I’d never bother (that’s what restaurants are for). Truth be told when it arrived I wondered if the chef had ever seen one before, let alone cooked one. It was the oddest looking tarte tatin I have ever seen; eight or nine thin slivers (not slithers, for the record: why do so many restaurant reviewers get this wrong?) 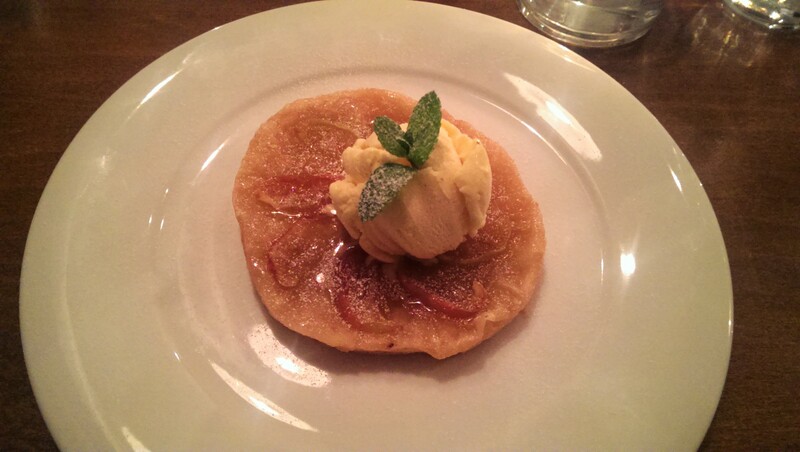 of unpeeled apple on a pastry base with a caramelised coating and a scoop of vanilla ice cream. If anything, my photo makes it look more generous with the apple than was actually the case. To my shame, I still ate it all because – as everyone knows – pastry plus sugar equals tasty. But it was an amateurish kind of tasty. Valpy Street’s website says that the menu is “locally sourced where possible” – that may be true in general, but the fact that nothing local turned up on the cheeseboard made me wonder if those words were there because they thought it was what diners want to read. Having got that whinge out of the way, it was an interesting selection none the less: on paper, at least. In reality, it was perhaps slightly less so. Saint Maure de Touraine was a pretty likeable goat’s cheese, but the tommette de savoie was mild verging on apologetic, a quality it shared with the Fearn Abbey, a Scottish brie-like cheese. What the board was crying out for was some contrast – a salty, crystalline cheddar or Comte that could exfoliate the roof of your mouth – but no such luck. Last but not least, there was Blue Monday, made by that chap out of Blur with the floppy hair. I’m more of a Graham Coxon fan myself, but to give credit where it’s due the cheese was spectacular – intense, savoury and delicious. I’m glad I ate it last, but even having it last it highlighted how bland all that came before had been. All the cheeses were maybe not as close to room temperature as they should have been (nor, now I come to think of it, was the dining room), but at least they weren’t fridge-cold. The accompaniments smacked slightly of overkill. There were a lot of crackers but no variety, so they were all sweet which didn’t really work with most of the cheeses. You also got a huge ramekin of onion chutney – far more than you could possibly eat – some celery which I suspect is left by almost everybody and some grapes. This was definitely a case where less would have been more, although I would have liked the advertised quince jelly which was nowhere to be seen. This is all sounding rather glum, isn’t it? Perhaps I should lighten the mood by saying that service – the incident with the peppercorn sauce aside – was properly delightful from start to finish. Both waitresses were bright, personable, knowledgeable and full of opinions about the dishes. And if it didn’t always come off that felt more the kitchen’s fault than theirs. As I said, I was also impressed that they swooped in and sorted the problem with my onglet – some serving staff would ignore those vibes (the way you can never get attention when you want to pay up and scarper, for instance) but they could clearly tell I wasn’t happy and managed the situation perfectly. Another positive: the wine list isn’t bad at all, with nothing over forty quid and plenty of interesting choices available by the glass. We tried a selection, including a really good, heady Malbec and a cracking Pic St Loup, a Languedoc red. Viognier, always a favourite of mine, was also extremely drinkable as was the cheapest white on the menu, a bright Spanish number from Extramadura. I would have had a glass of dessert wine with the tarte tatin, but they’d run out of one and the other was priced pretty aggressively for only 50ml. 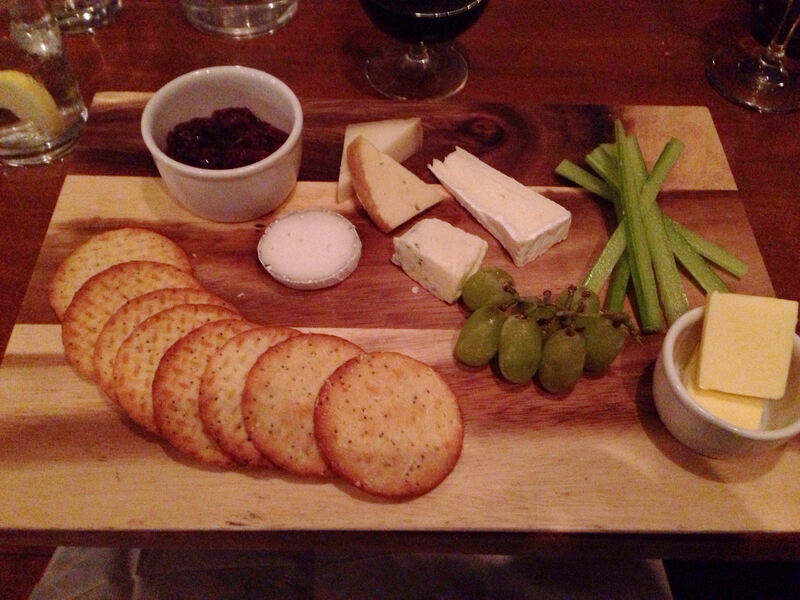 The LBV we ordered to accompany the cheese was nice but not surprising – maybe it would have tasted better paired with more interesting cheeses. The total bill came to ninety-one pounds, excluding tip, for three courses, two glasses of wine each plus that port. An odd experience: nothing on the menu was particularly expensive, and yet somehow that still felt a little steep. Reading really needs a restaurant like Valpy Street. An affordable, mid-market independent bistro is very much one of the places that’s always been missing from town. And, frustratingly, they’ve got many things right – the room is lovely, the menu looks brilliant on paper and the service is spot on. The menu has some bright ideas to draw daytime trade in, too, with lunchtime “pots” for six quid and a selection of upmarket sandwiches. But the evening menu – despite some moments of promise – didn’t set my world on fire. But all is not lost, because the management has proved they can do this. The menu has already changed substantially since launch, to the owner’s credit, and he didn’t even officially launch the restaurant until it had already been open for a month (a very soft launch indeed, in fact). It feels like he’s playing the long game, and on that basis I wouldn’t rule out Valpy Street rethinking some of the menu and pricing and fulfilling that obvious promise. It’s a tougher market out there than it’s ever been: Reading’s dining scene has changed significantly since Chronicles closed in 2008 and the competition has got better. I just hope Valpy Street can do likewise. Well, summer’s well and truly over. You can speculate about the exact time of death – when the kids went back to school, when festive toot started appearing in the shops (prosecco flavoured crisps, M&S? Really? ), that awful moment when you realised the central heating needed to go on – but those are details. The formal funeral happens tomorrow night when the clocks go back, and that’s that: it’s gone until next year and now we all need to come to terms with wearing extra layers, fishing the gloves out of the chest of drawers, deciding who’s getting what this Christmas and wondering whether this is the year you stop bothering with sending cards. I’ve found it especially difficult because I’m not long back from holiday. So it seems like only yesterday that I was sitting outside until midnight, eating grilled meats and salad, drinking that first glass of rosé as soon after midday as socially acceptable and reading novels by the pool. To return to a nip in the air felt especially cruel. And it’s not just me – I bumped into a colleague this week who’s just back from a holiday in Dubai, thirty-three degrees every day without fail, and I couldn’t help feeling even her tan looked a tad jaundiced. “It’s not my winter coat I’ve got on” she told me, “it’s my autumn coat” (in denial, I suspect – it looked like a winter coat to me). So this week I’ve been trying to find the consolations of autumn. I’m not talking about seasonal eating – I should care about that more than I do, but ultimately despite knowing all the reasons I shouldn’t buy Peruvian asparagus I still reckon it’s better than nothing – but the move into autumn does allow you to enjoy food that, a few months ago, would have been unthinkable. Slow-cooked stews and casseroles, steaming bowls of soup, big piles of mash and golden-domed pies. And the drinks, too; I know that Pimm’s is a wonderful thing but the months ahead mean we can glug red wine, or port, or mulled wine (proper stuff, not that shortcut in a bottle). That’s what led me to Waltham St. Lawrence on a weekday night, because I’d heard good things about The Bell. Someone suggested I review it with a certain trepidation, because they didn’t want the secret to get out – and that’s a good enough incentive for me. So I made the short drive down the A4, turning right just past Hare Hatch, and parking in the village I got out of the car to be greeted by the beautiful aroma of woodsmoke. It’s a lovely place. The pub is right opposite the church – as it should be in a picture perfect English village, if only to give people two different routes to enlightenment – and it’s beautifully, charmingly ramshackle (much as you would be if you’d been standing for seven hundred years). Inside it’s all beams and dark wood, panelling, horse brasses and open fires. There are a couple of rooms, all very basic and unshowy, although I now see having looked at the website that they also have a snug and what looks like a slightly smarter dining room; I’m glad I didn’t end up sitting in that. I was a little bit in love before I even sat down, but it developed into a full-on crush when I read the menu. I looked at one pub during the week, deciding whether to add it to my list of places to review, before realising with horror that it offered twenty-three different main courses; The Bell is nothing like that, with a small but perfectly-formed menu of five bar snacks, four starters, five mains and five desserts. I couldn’t see a single thing I didn’t fancy eating – pork pie, rarebit, Brixham mussels, venison, trout with lentils. It was a different menu to the one on their website, and I had no doubt that if I went back in a couple of months it would be a different menu again. But for now, it felt like a menu designed to make you happy to see the back of summer. Pigeon and pork terrine was, if not perfection, close enough that I couldn’t see anything to fault. 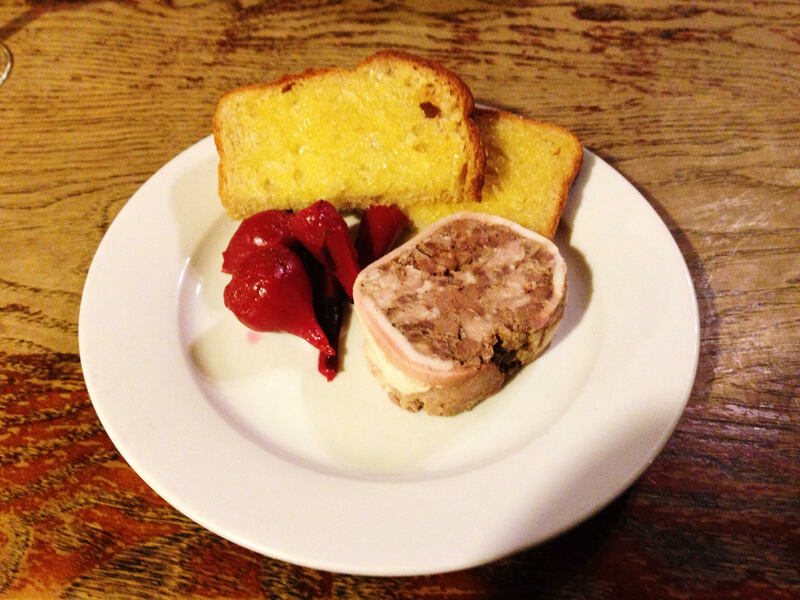 The terrine itself was a dense slab of rich, gamey meat, beautifully earthy and coarse, no jelly or bounce to it. But that wasn’t all, because there was also soft pickled beetroot, all sweetness and no sharpness, perfect with the terrine. And the bread was magnificent – thick sliced, toasted and buttered (or quite possibly buttered and then toasted, it had a golden glow and the texture of butter that had melted under a grill), it almost had a spongey, crumpetty texture. Three simple things, superb on their own, equally terrific combined. All that for six pounds fifty, and worth the trip on its own. 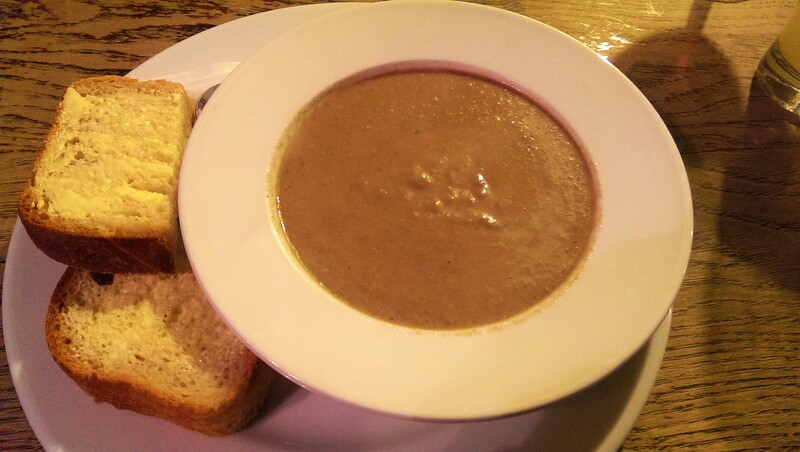 The thick, rich cep and blue oyster mushroom soup was an exercise in simplicity: the mushrooms, a hint of cream and a touch of seasoning was all I could detect in the bowl. There was more of that bread on the side, untoasted this time but also generously buttered. I found it strange that the butter wasn’t on the side, and if I’m being really critical I’d perhaps have liked a few herbs to bring out the flavour of the soup more, but those are both minor details. The portion was generous (how I struggled!) and made me want to go out and forage straight after. Well, straight after a nap, perhaps. Mains were sensibly paced after that – ironic, as the starters had been so good that, for once, I found myself ever so slightly impatient. It’s almost worth putting the clocks back just so you can eat venison again so I was delighted to see loin of fallow deer on the menu. The meat itself, again, was well-nigh perfect – beautifully seared, still pink inside, five thick discs of autumnal wonder. 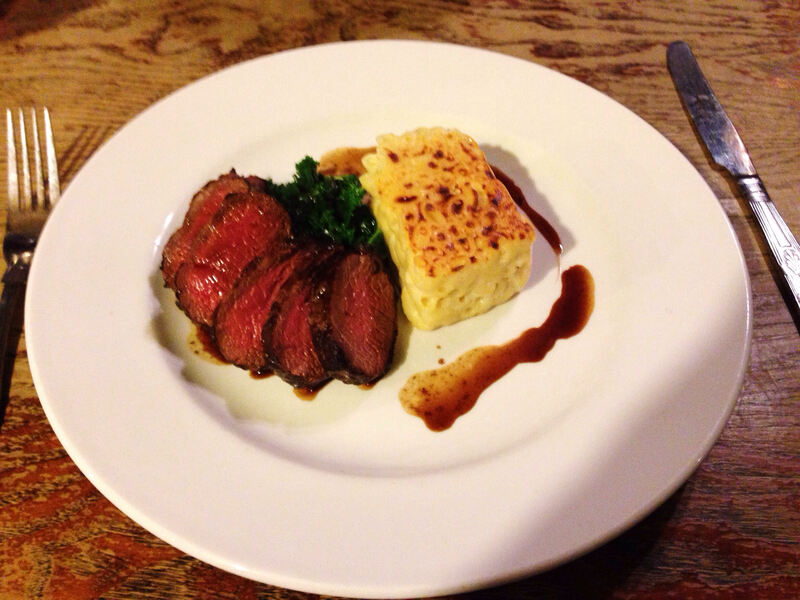 If the rest of the dish didn’t quite match that, it was perhaps because the bar had been set so high – the kale was well-cooked, steering the right course between the twin perils of mushy and crunchy, but it wasn’t the most exciting thing to serve with the venison. The real disappointment was the macaroni cheese, an oddly solid cuboid of the stuff which reminded me of the top of a pastitsio. It wasn’t quite cheesy enough, or salty enough, and under a fork it just crumbled into individual macaroni. It was a noble effort, but I think I’d sooner have had something a bit gloopier and more sinful, or even just a potato dauphinoise. Last of all, the thing the dish missed most – the roasting juices had been reduced to almost nothing, like a culinary Black Friday, and the whole thing needed some kind of sauce. If I sound critical it’s just because the dish was very good, when I knew how close it came to being unforgettable. 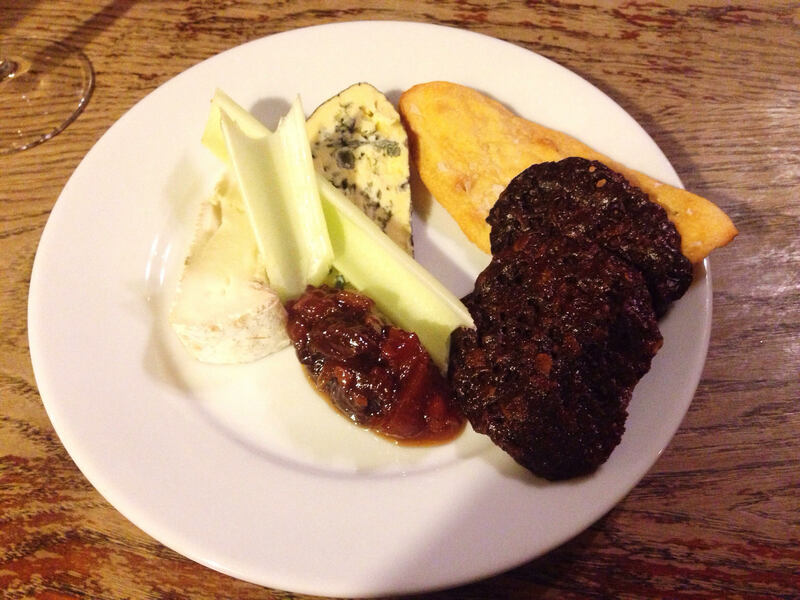 It’s rare that there’s a scrap to order the vegetarian main course (normally it’s quite the opposite, in fact) but that’s exactly what happened at The Bell. Big pillowy potato gnocchi came with a stunning kale and almond pesto, strewn with extra leaves of kale like the best cabbage in the world (I know kale is bloody everywhere right now, but not kale like this). 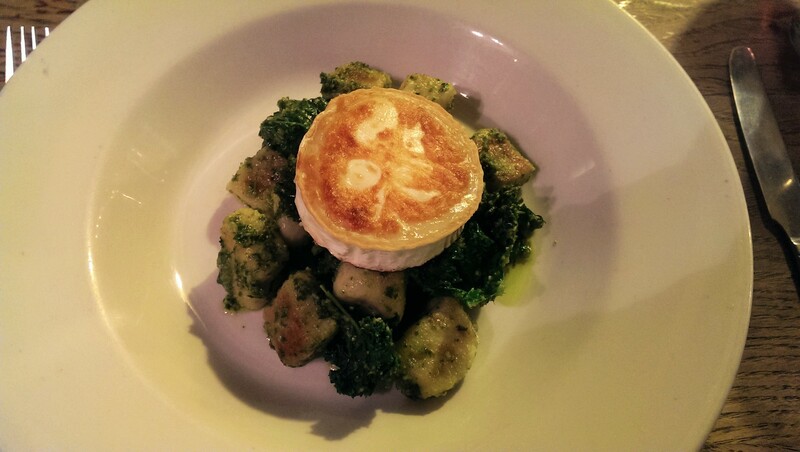 On top was a decent sized circle of caramelised goats cheese, grilled to just bubbling and perfect for setting off the richness of the potato. You could say this is starch and goats cheese, like unimaginative risottos in pubs across Berkshire, but this was so much more than that: clever, creative and damned delicious, and it really didn’t need any meat. It illustrated deftly that with a bit of effort and an imaginative chef it’s possible to eat delicious vegetarian food; it’s just a shame that this is such a rare accolade. I scraped every last morsel out of the bowl. Sometimes, when a meal is iffy, I order dessert to give the restaurant a chance to rescue matters. On this occasion I ordered dessert because I wanted to see if they were as good as the rest. And again, the menu was note-perfect – crumbles and puddings, hot desserts with ice cream quickly melting on them. But unfortunately, on this occasion, the desserts slightly took the shine off things. 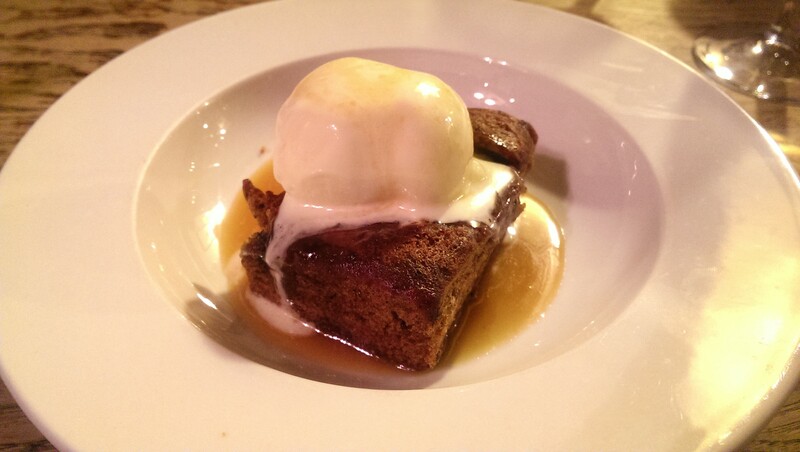 I picked the sticky toffee pudding because it came with creme fraiche ice cream, an unusual touch. Sadly it was more like a toffee cake than a steamed sponge pudding – dry and a bit chewy – and there was nowhere near enough toffee sauce to rescue it. The ice cream, to be fair, was truly delicious; thick and creamy with an intriguing slightly sour note – but that, too, wasn’t enough to save it. I left some, and I felt sad that I didn’t feel sad about that. I was in two minds about whether to have the cheeseboard, and when I went up to the bar I asked which cheeses were on offer. “Barkham Blue is one”, said the man behind the bar, “I’ll just check with the kitchen what the other one is.” Off he scuttled, and the man next to me said “Barkham Blue’s all you need anyway.” He was right, of course, and you got a good wedge of it, soft and salty, blue without being overpowering. The other cheese – and I quite admire them for only offering two – was Wigmore, also local, gorgeously mushroomy but still nice and firm. So far so good, and you could say it’s impossible to muck this kind of thing up, but the kitchen did have a go. The chutney was lovely, and went well with both, but the “house crackers” were a bit surreal. There was a long thin flatbread, a bit like ciappe de liguria, but the texture wasn’t right – it wasn’t crispy or crunchy, and felt stale. Odder still were the other crackers, which were more like biscuits – thin, treacly biscuits, like Hobnobs without the oats. They were sweet: sweet with burnt sugar, and although that sort of went with the Barkham Blue it didn’t go with the Barkham Blue as well as my favourite accompaniment, more Barkham Blue. I finished them in the same way I might finish a duff magazine article. If I haven’t mentioned service that’s because there wasn’t that much of it. You order at the bar and there’s minimal interaction when they bring the food to your table. That’s honestly no criticism, and everybody was lovely and welcoming and genuinely interested in whether we liked the food, but it does mean there isn’t much to say. There’s more to say about the wine. The Corbieres (less than a fiver a glass) was robust, punchy and went brilliantly with the terrine, the dessert wine was nice if not particularly memorable and not quite cold enough for me. The port I had with the cheese – a rich, complex Krohn LBV – was over far, far too quickly. All in all, dinner came to seventy pounds, not including tip. When I think of the price of some of the things I ate – that stunning terrine for six pounds fifty, the gnocchi for a tenner – it’s hard not to conclude that the people of Waltham St Lawrence are very lucky indeed. Would I go back? In a heartbeat. And if this review sounds critical, it’s only because the best of this meal was right up there with the best food I’ve eaten this year, and that means you judge everything else a little more harshly. But let’s put this in perspective – if you picked this pub up and dropped it in the centre of Reading (perhaps on top of TGI Friday, or Cosmo: somewhere nobody would miss) it would be difficult to keep me away. So go, even if it means the secret gets out: as it is, perhaps I’ll hibernate there in a seat by the fire, growing fat and sleepy on rarebit and red wine, finding it increasingly hard to remember that I ever used to get excited about sunshine and salad. Whatever you think of the food, Itsu’s biggest success – for me, anyway – may be how it’s transformed the bottom of Queen Victoria Street, banishing the grisly memory of temporary shop after temporary shop selling nylon shoes or mobile phone accessories. It gives that corner a certain glow, all shiny, fresh and welcoming; it’s strange how even though it’s only been open for a couple of months, it somehow feels like it’s been there forever. It forms part of a long-established trend, which on balance is probably a good thing, of smaller, more exclusive chains picking Reading to be in the vanguard for any expansion plans. Bill’s started this, of course, and then there was Five Guys, but although Itsu is the latest it’s unlikely to be the last: West Country pizza and cider chain The Stable is rumoured to be opening on Bridge Street, and Bristol-based barbecue specialists Grillstock were linked to a site on Friar Street recently. 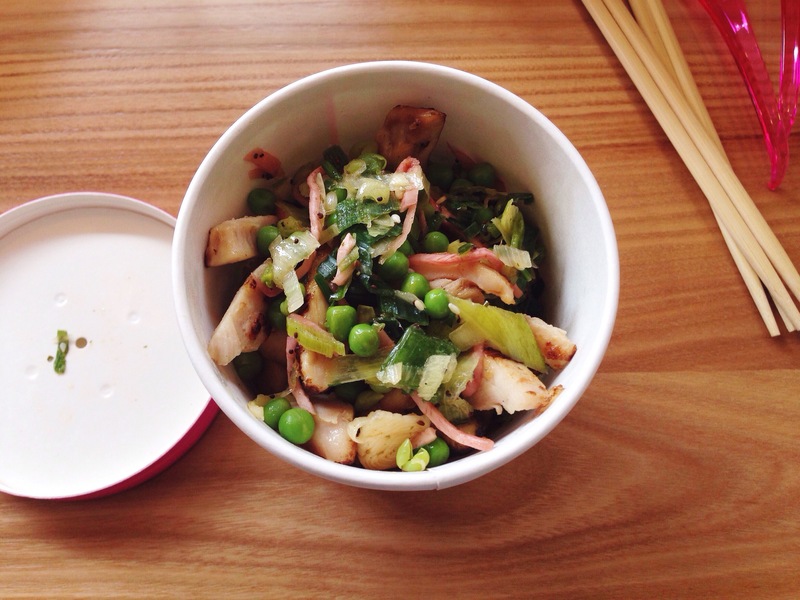 Itsu wasn’t top of my wish list of chains (I’d love a branch of Leon or Busaba, personally) but it’s an intriguing prospect – a place offering healthy lunches and dinners low in calories and saturated fats. Salads, smoothies, sushi, sashimi: splendid, surely? I’m one of those people who goes to Yo! Sushi with the best of intentions and then ends up ordering anything and everything the kitchen has to fry, but I decided to put my reservations (and my love of alliteration) to one side and give it a try one weekend lunchtime. Inside, the chillers are packed full of options – sushi and sashimi on the left and salads on the right (although many of the salads are in fact on a bed of sushi rice, which in some cases can make your dish look more like maki that couldn’t be bothered to get dressed). There’s also a range of hot noodle and rice dishes which you pick up at the counter. I decided to order a little of everything – in the interests of balance, naturally – so I headed up the stairs with a heavy tray and a growing sense of excitement. Now, before I get on to the food I’m afraid I need to wax lyrical about the view from upstairs, so feel free to skip this paragraph. It really is a gorgeous spot up there, full of tastefully done long tables with stools, USB charging points – which could come in handy if you plan to be on your iPhone for longer than, I don’t know, fifteen minutes – and most importantly a gorgeous first floor view out across town through the lovely floor to ceiling windows. In one direction you get to look up Queen Victoria Street, a symphony in Victorian red brick only equalled by the Town Hall, in the other you get to gaze out on John Lewis, one of Reading’s most handsome and iconic buildings. You can even make out, behind some of the façade, the word “HEELAS” in block capitals on the front of the building, a little detail for those of us who still think of it that way. It made me realise how few restaurants in Reading give you a view to go with your food, unless you happen to be a fan of Ed’s Diner (is anyone, I wonder?). That architectural diversion aside, let’s start with the good news: the chicken teriyaki potsu (Itsu’s slightly twee way of saying it comes in a cardboard pot) was truly splendid. Lots of slices of tender thigh meat, so much more interesting than breast, sat on top of a big pile of brown rice, itself so much more interesting than white rice. Interesting is the right word in general, because it managed that rare trick of making sure there simply wasn’t a dull forkful – so much going on in the rice, with beans and petit pois adding a bit of crunch, leek for sweetness and little ribbons of piquant ginger running through the whole lot. At first I thought the dish looked a little dry and that I might need to top up with the sauce bottles at the table, but digging deeper I got to the liquor, a wonderful sweet-salty mixture of teriyaki and broth that made every mouthful magnificent. If I was being critical it was warm rather than hot, but even having said that I could happily eat this every week for a year and never get bored. At little over a fiver it felt fairly priced for lunch and keenly priced for a light dinner, too. The sushi was less successful. 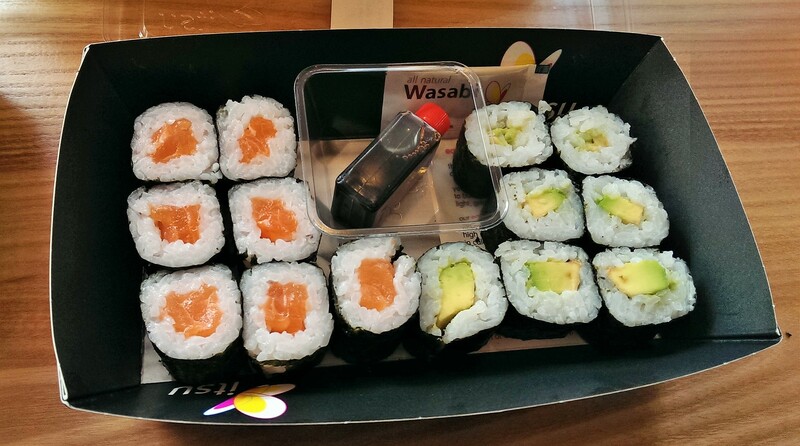 An assorted pack of small maki – seven each of salmon and avocado – felt a bit clammy, claggy and unremarkable. I didn’t mind them, and at about four pounds fifty they clocked in very reasonably compared to Yo!, but they were difficult to get excited about (a shame, because I adore avocado maki). I nearly didn’t order them because I wasn’t sure how much they would tell me about the kitchen’s skills but as it turned out they were badly rolled, with most of the maki having gaps where the seaweed didn’t form a complete circle. Prices in general are quite variable at Itsu, so although these were fairly competitive the sashimi and some of the bigger maki are priced outside the territory of a light lunch on the run. One of the salads I considered buying – a piece of rare salmon, some leaves and some dressing – was just shy of eight pounds, and I’m really not sure who out there is going to buy an eight pound salad from Itsu. The other dish I ordered, to cover all bases, was vegetable dumplings on a bed of sushi rice. I quite liked the dumplings but quite liked is probably as far as it goes. They’d been steamed and then chilled, giving the outside a texture just the right side of cardboard, but the filling was decent enough. They were sprinkled with something that looked and tasted like togarashi which gave them a bit of oomph and the wee pot of teriyaki sauce on the side added savoury depth to the proceedings. It didn’t quite disguise that texture, but it did make them feel a bit less like a health food. They came on a bed of rice, a thick layer of carbohydrates which didn’t remotely go and felt like hard work towards the end. You pay a quid extra to have this edible plate, and with hindsight I don’t think it was worth it. I did find myself thinking about Sapana Home, a hundred yards yet a whole world away, where you get a huge plate of freshly-assembled, freshly-cooked momo for only six pounds. I also worried about how many people would never discover Sapana Home because they never looked past Itsu’s snazzy exterior. I couldn’t quite bring myself to order a “raw smoothie” for just under a fiver (perhaps I’m not cut out for this whole healthy eating caper, because I just found myself thinking I could get a pint of cider and a packet of Scampi Fries in the Allied for that), so instead we went for a couple of drinks from the fridge. Coconut and lime pressé, which isn’t made by Itsu, was light and refreshing, although I got more lime than coconut. The carrot and ginger juice drink (also known as “Detox iii”: what a horror movie that would be), which is made by Itsu, was pretty grim. I was expecting something like the terrific carrot and ginger juice you can get at Bill’s but this was a nasty, thin, watery pastiche of proper juice. Looking at the label I got a vague idea why: water was the single biggest ingredient in it. It also contained a mysterious substance described only as “Thorncroft detox cordial”, which sounds about as enjoyable as an hour stuck in a lift with Gwyneth Paltrow. That sums up my problem with Itsu, because it doesn’t make healthy eating as fun as the happy-clappy blurb on the website and the pictures of people enjoying volleyball outside the shop suggest it will be. The staff are lovely, and my hot chicken teriyaki dish was beautiful – if I went back, it would be for more of that – but still something about the place jarred with me. Even the cans of Coke in the fridge are a mingey 250ml rather than the standard issue 330ml (drink them if you absolutely must seems to be the message). The meal for two, three dishes and two drinks, came to just over eighteen pounds, which feels like a lot for what we had, especially when you think how much of it was just rice. Also, I’m just not sure when I would eat here rather than spend less and go to a café or spend more and go to a restaurant. I have no doubt that Itsu will do extremely well – the crowds already suggest I’ve got this one completely wrong – but it left me really fancying a KitKat Chunky. Or some Frazzles. Or a chip butty. Something tells me that wasn’t their intention. I like to think, by now, that I’ve got a pretty good idea what people are interested in reading about on ER. You love a hatchet job, you want to hear about restaurants and cafés in the centre of Reading and, perhaps more than anything, you like the discoveries: places you’ve never heard of or would never have considered going to which get good reviews. You’re not so fussed about places that are too far away and you don’t much like wishy-washy reviews where I like somewhere but don’t love it. Am I close? So, with all that in mind I headed off to Henley (bad) to review somewhere that I was hoping would be a bit of a find (good). Well, to spoil the ending for those of you who don’t scroll down and back up again, it wasn’t a find. But don’t worry, because it was so bafflingly bad that you might stick around anyway to read the rest of the review (good for you, regrettably bad for me). I almost went to The Square a few months back on my last visit to Henley, but the blinds were ominously drawn. At the time, I worried that it had closed down and I’d missed my chance to try out this attractive looking Portuguese place in a prime location on the market square. It later transpired that I’d worried unduly (they’re just closed on Tuesdays). I took that to be a good sign, signifying that they were doing well enough to give the staff a day off. More fool me: sadly when I went back this time, it was open. Inside it wasn’t exactly busy – four other tables were occupied when we turned up on Saturday night, peak time for any restaurant. That probably should have rung some alarm bells, as should the fact that when I phoned to book a table at very short notice the chap on the other end of the phone didn’t even need to take a name. I must have been having an off night, because I sat down, Spidey senses resolutely tingle-free. Perhaps I was deceived by the surroundings: it’s actually quite a nice dining room, with dark wood tables and floor, the walls hung with fishing nets filled with shells, sea-themed pictures around the room. That makes it sound like Old Gregg’s boudoir, but in reality it was more rustic fisherman chic. The menu was bewilderingly big, with large sections for fish, seafood and meat dishes. Again, I took encouragement from one of the waiters coming out with a good-looking platter of fresh fish and shellfish to show what was on offer. There was also a section of speciality dishes for a minimum of two people to share, all described as “rice pots”. I asked one of the waiters to tell me a bit more about those and even now I’m struggling to remember what he told me (a combination of his mumbling and the vagueness of his response). They sounded a bit like paella, and he particularly recommended the lobster version (“we put a lot in”, he said), so in the end we went for that. We were told this would take thirty-five minutes to cook, so he practically sprinted to the kitchen to tell them before coming back to take the rest of our order. Maybe, with hindsight, he was worried that we might change our mind. We ordered some bread with sardine and tuna paté to tide us over and this is where it all started to go wrong. I don’t normally photograph the bread, but here I just had to. I was expecting a basket of crusty bread with a couple of small ramekins of paté. What arrived was seven anaemic slices of what looked like part-baked supermarket baguette with some catering packs of butter and paté. The “paté” was Portugal’s answer to Shippam’s (something I’ve not eaten since about 1985), smooth to the point of being unidentifiable. In fairness, even if it wasn’t pleasant I suppose it was authentic: it’s almost exactly what I was served at O Beirão, Reading’s Portuguese restaurant. But there it was free, and here I was paying three pounds for the dubious privilege. 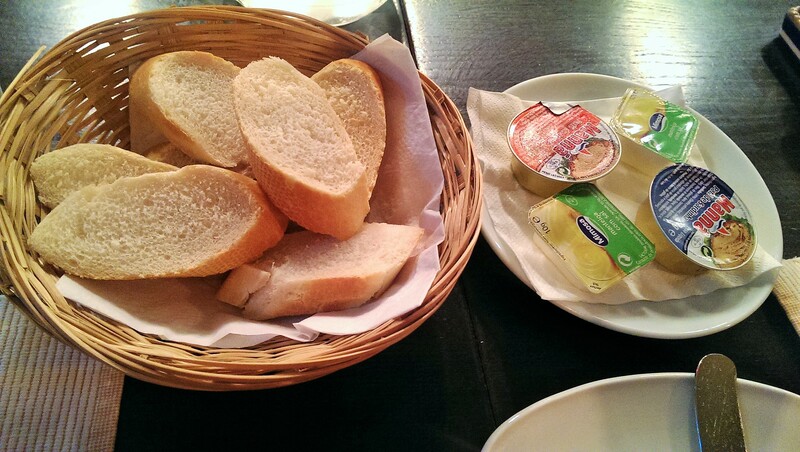 What The Square also seemed to miss was that the bread was completely insufficient for the spreads it came with. I would have minded the three quid less if I could actually have eaten it all but there was so little bread that doing so was impossible without piling the paté ludicrously high. I just hope the restaurant has a cat who could make use of the leftovers. Not terribly appealing: I prayed that the starters were going to be an improvement. They weren’t. 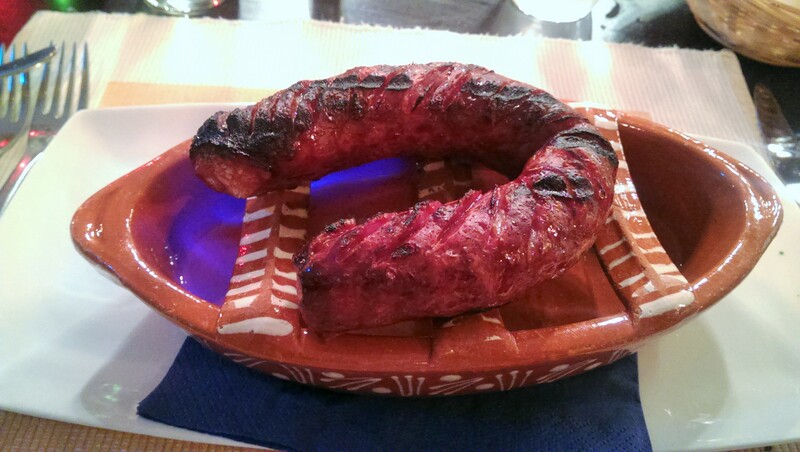 First up was the chouriço assado, described as “flame grilled Portuguese sausage, served in traditional cookware”. I was hoping for something a bit like Spanish chorizo cooked in wine, all salty and coarse with those delicious brick-red juices at the bottom. I was very far from correct. What I got instead was simply awful: a gigantic horseshoe of chorizo, served on a pot in the shape of a rowboat which is quite hard to describe. It sort of rested on the “seat” with some liquid underneath – I dread to think what – which had been set alight to flambée the sausage (flambée the sausage, come to think of it, sounds like a euphemism for something unspeakable) just before it reached the table. The outside was slightly charred in places but the real problems came when I cut into it. Not that that was easy, because it was served on a flipping boat shaped pot with no suitable surfaces on which to do the deed. I sawed away (trying to rest the sausage on the seat) and chewed a couple of slices for a few minutes, although it felt like longer. It was both grisly and gristly. I inflicted a slice on my companion, who unsurprisingly didn’t thank me for it. The next slice was almost entirely a big white globule of fat and that, I’m sorry to say, is where I gave up. All the metaphors I could use to describe this dish would remind you – very quickly – of whatever you ate last, so let’s leave it at that. I put down my knife and fork and waited to see if anyone came to check on us. They didn’t. 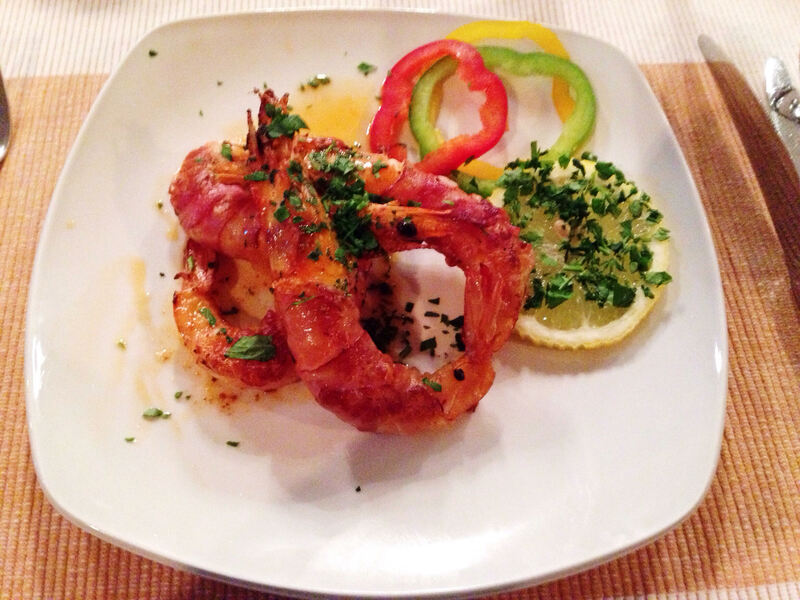 The other dish was king prawns wrapped in Portuguese bacon and pan fried. It was four decent sized prawns cooked nicely and indeed wrapped in bacon. The heads and tails came off cleanly and the prawns tasted of their component parts, no more, no less. There were also a couple of needless sections of red, green and yellow pepper. This wasn’t bad by comparison with the chouriço, but you could say the same about a Fray Bentos. I was hoping for some juices, but there weren’t any. I didn’t mop-up the non-existent juices with the remaining bread they hadn’t given me. The waiter returned to clear the plates and looked baffled by the almost entirely uneaten sausage. I tried to explain what I hadn’t liked about it. Doing so briefly was something of a challenge. He shrugged. I was worried that I hadn’t explained properly, so I had another go. More shrugging. The plate was taken away, with no apology or offer to take it off the bill or anything else. Then he asked whether I wanted to order something else, but with no indication as to whether I’d be paying for that or not. We then reached a consensus that, as the main course was quite big, I probably wouldn’t need a starter. The whole thing was a truly bizarre interchange. It was rendered even more bizarre by him asking if we wanted to keep our half-finished tubs of tuna and sardine paté: as there was no bread left I’m not sure what he thought we were going to do with them. 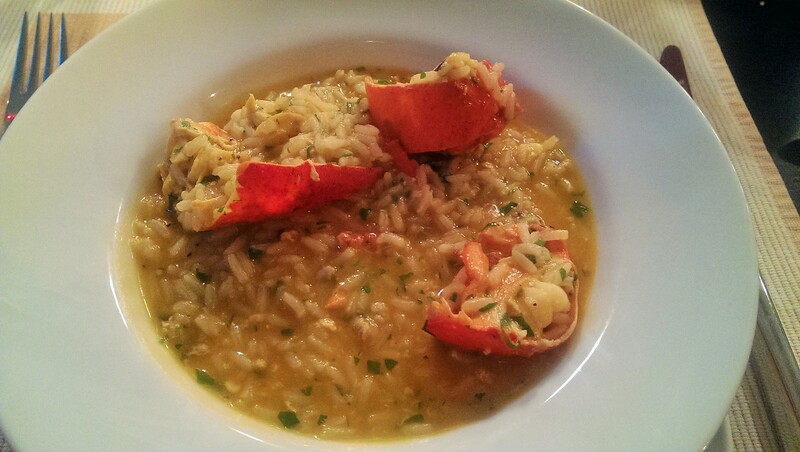 On to the main event then – the lobster rice pot, at forty-five pounds for two one of the priciest things on the menu. We were brought lobster crackers and those little picky-outy-lobster-bit tools (apologies for blinding you with technical terms) and I realised that I had naively expected the kitchen to do some of the hard work for us. My mistake, I suppose. Anyway, the large pot was brought to the table and the waiter ladled out a portion for each of us. The lobster, admittedly, was good. Very fresh and, when it was eventually possible to pick up the shell (which was as hot as Hades, of course), generally the flesh came away very easily. The meat was tender and delicate and it did look to me like we had a whole lobster between us. That’s where the good news ends. The rice, fluffy long grain, had been cooked for too long so there was no bite there. The sauce was a generic stock with some coriander to try and give it a bit of freshness. I’m beginning to sympathise with the trouble the waiter had describing it, but I suppose he could hardly have said “it’s a very bland rice dish with some lobster in it”. I can though, because that’s what it was. Was it a forty-five pound dish? Put it this way – at the peerless Bird In Hand in Sonning Common I could have a whole lobster to myself for twenty-seven pounds, so to pay roughly the same for half a (not very big) lobster and some flavourless rice seems cynical. If this is a signature dish, you have to worry about the restaurant’s handwriting. To drink we had an Appletiser (for the driver) and a very nice smoky glass of Portuguese red. If the restaurant had been good I would have regretted not being able to mount a concerted assault on the wine list. If it had been good we would have had a dessert and I would have wanted a port – a lovely rich vintage, or a sweet, subtle tawny. As it was, much as the meal could only have been improved with alcohol, I was glad we could cut our losses and leave. As so often, the moment I started to actively dislike the food the waiter tried a little harder to be nice. In the early stages he seemed to struggle to communicate, whether that was describing the menu or explaining what we could do about The Dismal Sausage. After that he was a lot more attentive, asking whether everything was okay with the main course, whether we needed any more drinks, whether we wanted dessert and so on. But of course the damage was done by then – and most of the damage was done in the kitchen rather than front of house. Proof that their intentions were better than their delivery came when the bill arrived; dinner for two came to sixty three pounds (the chouriço had been taken off). So there you have it: this week I went out of town to a restaurant which I hoped would be a find and turned out to be a disaster. And this is definitely not about Portuguese food, which is probably what frustrates me the most. Portuguese cuisine deserves a better ambassador than The Square: Lisbon is an absolutely incredible city full of great cured meat, fantastic fish and seafood, and magnificent cheeses, not to mention the stunning wine. Having been there I don’t understand why it doesn’t have as good a culinary reputation as any European capital. I can only imagine it’s because of places like The Square. I want to be kind, but everything I ate was either iffy or average. Every average thing I ate was expensive. And worst of all? I’ve just spent two thousand words telling you not to go somewhere you’ve never heard of and wouldn’t visit anyway. That sticks in my throat even more than the chouriço did. Although a lot of people complain about the proliferation of coffee shops in the centre of town, for me the biggest growth has been in places to lunch. In the old days your choice was between Picnic, Pret and Workhouse but now there are a plethora of options, from Shed to My Kitchen, from Artigiano to Manhattan Coffee Club, with new ones seemingly opening every month. So far so coffee, but two of the most recent arrivals, Itsu and Wolf, are more centred around food and have sprung up near John Lewis (the closest thing Reading has to a cathedral), changing the balance of town slightly and drawing footfall slightly away from the Oracle. Both have been on my list for a while, but Wolf gets the nod this week because it’s slightly better established, and I wanted to give Itsu a little longer to settle in. 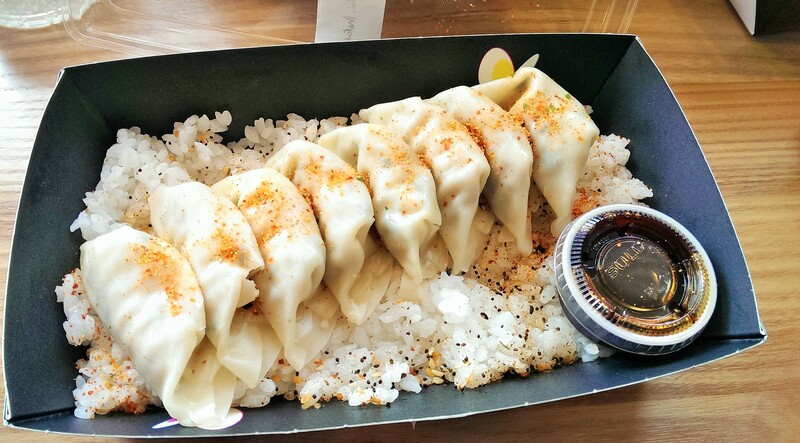 Besides, Itsu is a well-known chain (admittedly in London), whereas Wolf is a much smaller affair, with two branches in Reading and – rather randomly – another couple in Chiswick and Leeds. I was a bit sniffy about the prospect of “Italian Street Food”, which is apparently what Wolf offers, mainly because I wasn’t convinced it existed. But in fairness, I’ve never been to Italy so I did a bit of research and it seems that there is indeed such a thing – paper cones full of fried seafood, meat on skewers, stuffed fried olives, arancini, delicious fatty porchetta packed into bread. A quick Google and I’d gone from zero to ravenous in about two minutes. So far so good, but there’s a catch: standing outside Wolf, I had a quick look at their menu and it bore no relation to anything I’d seen, to the extent that I’m not sure whoever designed the menu had ever been to Italy either. Going inside, the concept was explained to me by one of the people behind the counter: first you decide whether you want bread, piada (a wrap not unlike a tortilla), pasta or salad. Then you pick some protein or vegetables to put in it. Then you pick a sauce, and finally you select a few toppings, from salad, olives, cheese and various other antipastoid options. I’m going to run out of positive things to say very quickly in this review, I’m afraid (right after I point out that the staff were very friendly, I suspect) and this concept felt very much like it had been appropriated from elsewhere. You pick your options as you move down the counter, being served by a different person at each stage, in an assembly line which feels very familiar to anyone who’s ever been to Mission Burrito. You choose what to go in what is fundamentally a sandwich, just as you would at Pierre’s or Shed. 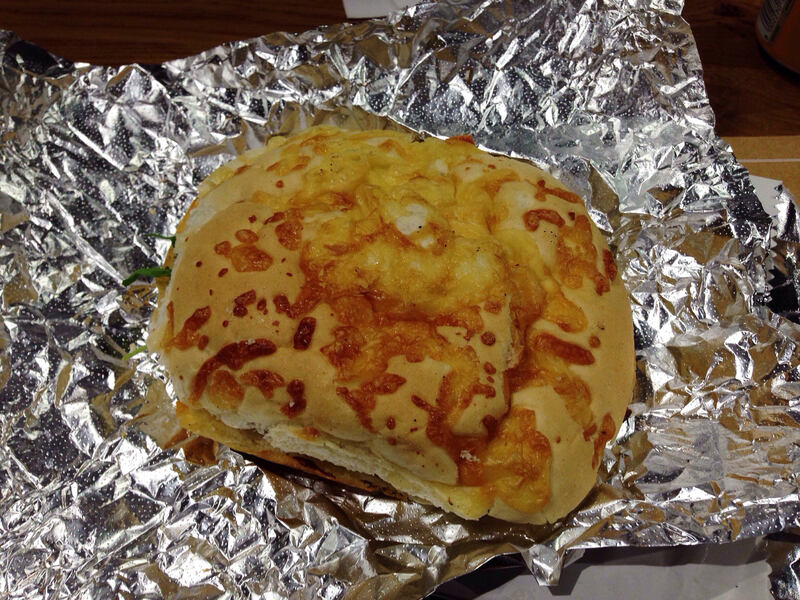 Then they wrap it up in foil and put it in a bag for you, which is reminiscent of Five Guys. The feeling of disappointment and being underwhelmed, though, might be unique to Wolf. So my sandwich was lemon and garlic chicken, in a big cheese-topped bap which was described on the menu as focaccia but was nothing of the kind. Also inside were an inoffensive tomato sauce, some sundried tomatoes, some artichoke hearts and some rocket. The bap was too big and floppy to eat tidily, but there wasn’t quite enough chicken to fill it. Everything tasted pleasant enough but impossible to get excited about. I half expected the chicken to be hot, but it wasn’t – the only warmth came from the split second the bap had spent on a hot plate, not enough time to give it any toasted texture or any real interest. All that for a fiver, and the only concession to street food was that they didn’t bother to give you a plate. In the interests of trying all aspects of the menu I also ordered one of the eleven inch stone-baked pizzas. 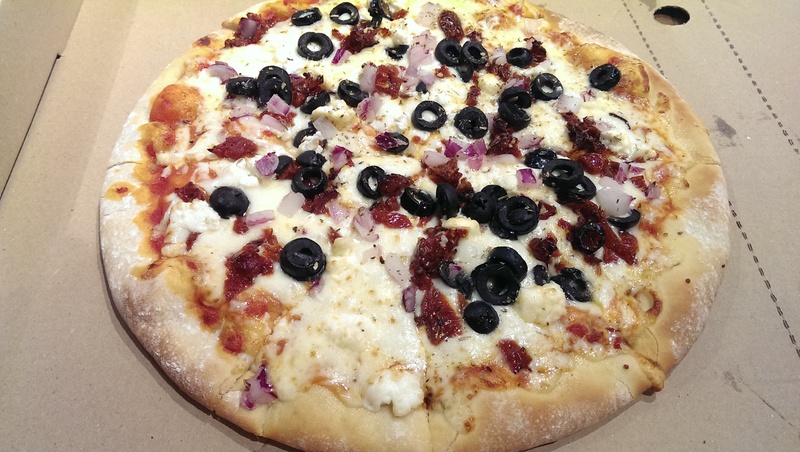 I was expecting (perhaps a little too optimistically) a thin, hand stretched pizza dough with a sprinkling of fresh-looking toppings – in this case sun dried tomato, red onion, olives and feta. What I got was a thick based pizza (perhaps not quite as pillowy as the sort that gets delivered by moped) with mostly mozzarella on it. Lots and lots of mozzarella. There was enough tomato sauce to identify it, a few flecks of feta cheese and rather more black olives (that looked like rubber washers from a tin) than I was expecting. If I’d been ravenously hungry or, perhaps, drunk, this might have been right up my alley. Instead it felt like way too many calories for not enough flavour. Except salt. All that cheese made it extremely salty. I left half of it and I wish I had left more. Again, no plate. I haven’t talked about the room, something I normally do earlier on in the review. That might be because it’s not very nice. It’s another long, thin space – barely wider than a corridor – with tables along one side, big mirrors on the opposite wall and no natural light. The tables outside (yes, with yet more Tolix chairs) are nicer, but even in an Eames lounger this food would taste pretty ordinary. One sandwich, one pizza and two cans of San Pellegrino fizzy drinks – with plastic cups, no glasses either – came to just under fourteen pounds. I’m sorry that I can’t be more positive about Wolf, but the best I can say is that the food isn’t unpleasant. Normally the lack of authenticity wouldn’t bother me, but it does here because it feels like Wolf is a Frankenstein’s monster, an attempt to patch together a bunch of food trends to try and make money out of diners. There are better pizzas all across Reading (although they do cost more than six pounds fifty) and better – and cheaper – sandwiches anywhere you care to name. Maybe you’re paying for the choice, but I found standing at the counter that I didn’t want all that choice. I wanted a small range of good, classic flavour combinations rather than the gastronomic equivalent of the numbers round in Countdown. I used to love eating at Fasta Pasta in Oxford’s Covered Market, where you could get big, fluffy ciabatta studded with olives or sundried tomatoes, filled with fresh discs of mozzarella, salty, intense pesto and top notch Parma ham which had been sliced there and then in front of your very eyes. Authentic, classic, delicious: compared to that, Wolf is about as Italian as Captain Bertorelli eating a Cornetto on Clacton Pier. It’s not street food, just pedestrian.